The best photo application for iOS devices is now available for Android. 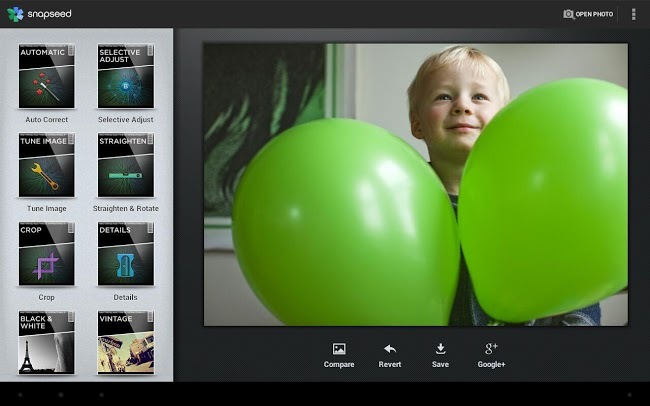 Nik Software, now owned by Google has released free on Google Play Star application Snapseed . The iOS version also happened to cost $ 4.99 to be free. Snapseed for Android offers a powerful photo editor with advanced features that can only offer the leader in digital photography software. We can adjust many parameters of our photos, such as pitch, correct color, contrast, brightness, saturation, temperature, sharpness, straighten, crop, selective adjustment to enhance objects or areas , focus, Tilt-Shift effect, lots of filters frames and very customizable, and many more options. Snapseed for Android is available for any device with Android 4.0 or higher , with Google+ integration and is translated into English, Spanish, German, French, Italian, Brazilian Portuguese, Japanese, Chinese (traditional and simplified) and Arabic.